In January, McDonald's released a limited batch of 10,000 Big Mac Sauce botttles across the United States. Customers had to download an app to find the McDonald's locations that were giving the bottles away. A few lucky patrons who put in the work were able to get their hands on a bottle or two. Some even capitalized on the giveaway by selling off the bottles online, though leaving their burgers dry and unwanted. One guy decided to not only sell the bottle, but throw in his mixtape as well. Bay user mrjohnacc decided to be one of many to throw the limited edition Big Mac Sauce bottle onto the auction site for a hefty sum of $10,504. 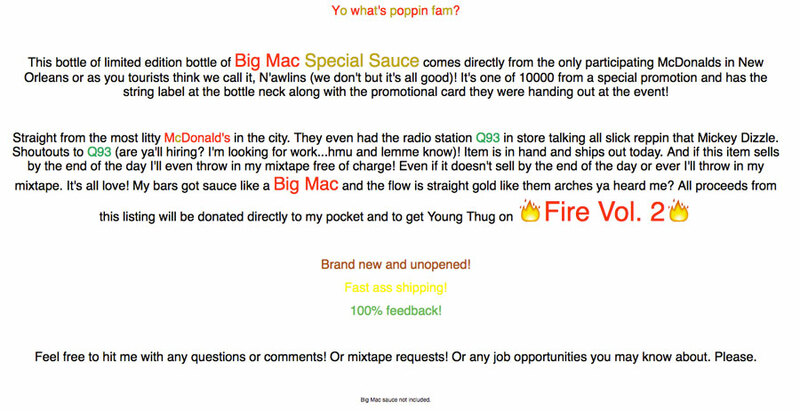 However, unlike other sellers, he decided to also throw in an original mixtape with the bottle of burger sauce. Here are some details from his sale. Wait, what's that at the bottom? In a super sus turn of events, this dude threw a tiny disclaimer at the bottom of his descriptor. Whether he's not really giving out the Big Mac Sauce with the sale remains to be seen. We'd be a little more careful buying this bottle. Especially if you're willing to drop $10,000 on it. Hey, you can always just hit him up for a free mixtape though.